The 2520SMD discrete operational amplifier has fast slewing, current drive capacity for driving inductive loads, medium high gain and high input impedance. 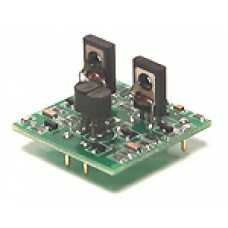 The unit is a surface mount recreation of the API® 2520 operational amplifier. The unit will operate on supplies as high as +-20VDC. The unit is supplied assembled and tested. The board is 1 inch x 1 inch square and 0.8 inches high (26mm X 26mm X 20mm). Connections to the module are through 0.040 diameter Mil-Max pins laid out on the industry standard modular operational amplifier pattern.